A beautiful new 210-page book “Artful Adornments: Jewelry from the Museum of Fine Arts, Boston”, written by Yvonne Markowitz, the MFA’s Rita J. Kaplan and Susan B. Kaplan Curator of Jewelry, has just been published. 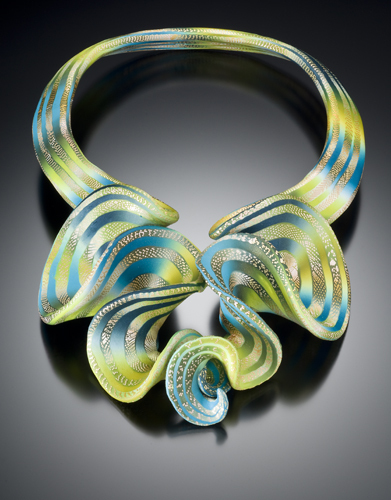 The last piece of jewelry to be shown in the book is Elise Winters’ Citron Ruffle Neckpiece. The position of Elise’s work in a strategic location in this important book indicates the esteem with which the curator holds the genre of polymer art jewelry. The MFA has a collection over 11,000 jewels and a work of polymer was chosen as one of only 125 pieces to be included in the book. “Artful Adornments” features works from the MFA’s jewelry collection with over 200 color illustrations and presents an array of adornments, from an emerald and diamond brooch once owned by the cereal-fortune heiress Marjorie Merriweather Post, to a rock crystal and gold amulet found in the tomb of an ancient Egyptian queen, and a 20th-century kinetic necklace influenced by the mobiles of Alexander Calder. Thematic chapters illuminate the many ways in which jewelry has functioned in society. Beginning with some of the earliest known manifestations of the uniquely human urge to adorn the body, the first chapter unveils magical jewels made out of materials believed to safeguard, heal, or confer special powers on the wearer. Ornaments that signify the wealth or power of an individual make up the second chapter, and, in the third, tokens of affection and remembrance are brought to the fore. The final chapters explore adornment as dress and jewelry as an expression of avant-garde art movements. “This is an example of a technique the artist developed and calls “crazed acrylic.” She states, “I begin by painting the unbaked polymer with acrylics. Metallic and custom formulated interference paints and glazes allow me to create shimmering surfaces with subtle color shifts. Once the paint dries, it becomes a brittle skin. With specially designed tools, I score and etch the hardened paint. then I manipulate and stretch the soft raw clay beneath, revealing a fine network of cracks in the painted surface.” This neckpiece as created from large sheets of variegated colored polymer wrapped and layered around a gray core. Then it was hand formed by pushing and pulling out each ruffle. Substantial armatures and braces support the piece during the curing process. The “Ruffle” series began as a bracelet form in 2007. Elyse Zorn Karlin is a guest contributor to Polymer Art Archive. She is the co-director of the Association for the Study of Jewelry & Related Arts (ASJRA), an association open to anyone who has an interest in studying jewelry and jewelry history. She is executive editor of its magazine, Adornment, The Magazine of Jewelry and Related Arts and runs its annual conference and American Jewelry Travel trips. She is the author of “Jewelry and Metalwork in the Arts & Crafts Tradition“, co-author of “Imperishable Beauty: Art Nouveau Jewelry“ and a well-known lecturer. As a freelance curator she is currently working on “International Art Jewelry: 1895-1925″ which will open in October 2011 at The Forbes Gallery, New York City.